My wife, myself and our one year old son stayed at this property for two full weeks. I was simply amazed at how quiet and beautiful the location and the home was. The main house had ample space and all of the necessities to cook our own food with. The chairs and built in seats had wonderful views of nature and were very comfortable. The outdoor area was larger than we expected with lots of outdoor seating. We really made use of the BBQ! Lastly, the main bedroom was incredibly comfortable and even though we weren’t used to the long sunlight hours, we slept very well. (I am very tall and often struggle to find good beds in Europe, but this bed was perfect!) Helle and her husband just finished another bedroom cabin and my son was the first to use it. This gave us extra space we weren’t expecting which worked out very well. Helle made sure of our privacy while also making sure we had everything we needed. She is an amazing host! We absolutely recommend this home to anyone. The coastal towns and close proximity to all of the attractions in Denmark make this property a vacationer’s dream. What a lovely description of your stay and if our property, we can’t thank you enough. You were wonderful guests and we are so happy that it was your sweet and happy child that was the first to sleep in the new annex. We would love to open our house for You any other time. Romantic, quiet and fully equipted house for a perfect holiday. The host is very helpful and hospitable. A beautiful environment and nice places to visit, te sea and ofcourse Copenhagen. It was a pleasure to meet You and to have you as guests. You are always welcome back any other time. Great location; has everything you need! We loved this property for a quick weekend getaway and only wish we could have stayed longer! Helle was very accommodating and an overall great host. The property itself has everything you need to relax and prepare your own meals. This was a great base for us to explore the area north of Copenhagen and the city itself, while still enjoying some peace and quiet in the evenings. Perfect location for a family of four in the summertime. So glad that you enjoyed your stay and thank you for your feedback. we wish you all the best and you are welcome back any other time. We were there for one week and had a great time. The place was clean and had everything one needs for daily use. It was in a quiet area and not far to the sea. Nearby are supermarkets. We enjoyed every second at the house and can recommend it for a relaxing vacation. The host, Helle, is very friendly and helpful. We are looking forward to come back for another vacation. Thank you Zohra. I hope we will meet again. 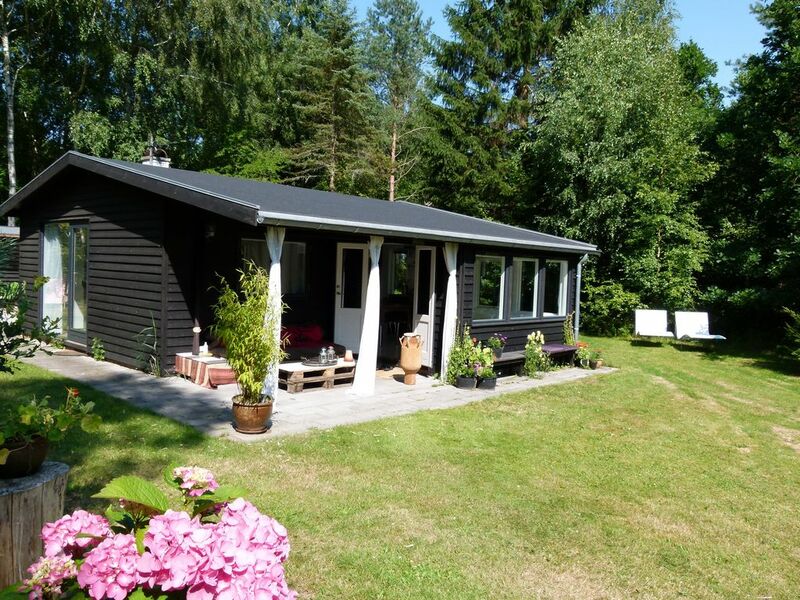 This modern house kept in Black and white is situated 6 kilometers from one of Denmarks most beautiful beaches. you can reach it by bike, car or Walk though the forest near by. Denmarks largest lake is only 10 minutes walking distance from the house, so as you Can read, sea, lake and forest very near. The house main building is one Big room and open kitchen, and bathroom. All in all 48 squaremeters. Beside this is the annex, 22 sq meters. You Can sleep in both houses and the house is maximum suitable for 4 persons. The grosserie is 10 minutes walk and open every day. One of Denmarks Best restaurants reacable within 5 minutes. booking beløb udgør 25% og falder til betaling ved booking. Resterende betaling 15 dage før ankomst. Gratis afbestilling op til 15 dage inden lejeperiode, herefter mister du dit indbetalte depoitum. Afbestiller du med 1 uge eller kortere varsel mister du det fulde beløb. Rengørings depositum 50 Euro Håndklæder og sengetøj er inkluderet. Der findes 3 cykler ved huset som du frit kan benytte. Fra November til maj skal lejer afregne for Elforbrug.